The Oklahoma City National Memorial & Museum features a Reflecting Pool. After the unspeakably tragic events of April 19, 1995, Oklahoma City worked to rebuild and recover the 48-square-block affected by the terrorist attack and create a poignant marker where visitors could pay their respects and understand how the bombing affected the Sooner State then and now. When planning discussions ended, the Families/Survivors Liaison Subcommittee landed on eight crucial elements of the memorial: remembrance, peace, spirituality & hope, cherished children, comfort, recognition and learning. The Memorial Task Force Advisory Committee came up with two resolutions, the first being to create a Memorial information center containing victims’ biographies and photos, as well as survivors’ stories and photos. The second resolution required incorporating the Survivor Tree into memorial plans and protecting it, after rescuers took notice of the American elm tree that remained standing despite the blast. On April 29, 2000, the fifth anniversary of the bombing, President Bill Clinton officially dedicated the Outdoor Symbolic Memorial. Each year, visitors gather at the Outdoor Symbolic Memorial for the Day of Remembrance anniversary ceremony. Year-round, visitors come from across the globe to reflect while walking along the sacred ground where the Murrah building once stood. The outdoor tour starts with a walk through the symbolic Gates of Time; the East Gate marks 9:01am, while the West Gate marks 9:03am, framing the 9:02am bomb detonation. 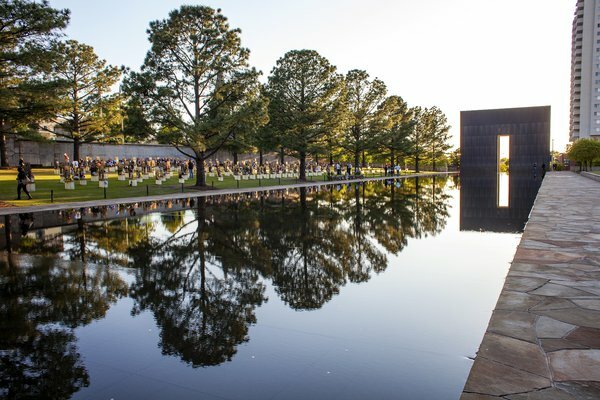 As you move through the memorial, take a quiet moment to yourself at the peaceful Reflecting Pool before marking a moment of silence in the Field of Empty Chairs; here, 168 chairs stand in as physical representations of the Murrah building victims, arranged into nine rows representative of the building’s nine floors. From there, guests can stand in front of the salvaged granite that comprises the Survivor wall before heading over to the Survivor Tree for a serene overlook of the full memorial. Guests can then say thanks to rescuers and volunteers who helped relief efforts inside the Rescuers’ Orchard. Finish the outdoor tour with the Children’s Area tiles decorated by children across the country before leaving a token of remembrance at the 200-foot fence. On February 19, 2001, President George W. Bush dedicated the indoor Oklahoma City National Memorial Museum – giving visitors a chance to have a more in-depth experience. Inside the Memorial Museum, guests experience 10 sequential chapters of the indoor educational center, starting with an orientation video in Chapter 1, which is followed by neighborhood history in Chapter 2. Visitors can then hear audio captured at an Oklahoma Water Resources Board meeting before listening to helicopter news footage taken outside the Murrah building in Chapter 3 of the museum. In Chapter 4, scan detailed artifacts and view video footage featuring survivors’ experiences before reading global news bulletins and stories from rescue and recovery members in Chapter 5. Continue on to Chapter 6 to view cards and letters that streamed in from across the nation after the tragedy. Continue to Chapter 7 where victims’ personal photographs, artifacts and biographies chosen by their family members are featured, before stepping into the Chapter 8 space. Here, guests can tune into oral stories about the bombing’s overall impact on Oklahoma City and how the state came together to heal. From there, walk through Chapter 9 and focus on the bombing investigation and eventual criminal conviction through crime scene photos and evidentiary boards pieced together by investigators. Before heading into the final chapter of the Memorial Museum, guests can see a piece of the original Journal Record Building and its sustained damage. In the Chapter 10, take in views of the downtown skyline for a full perspective of how Oklahoma City rebuilt and experienced an inspiring renaissance in the years after the bombing. Since April 2001, hundreds of thousands of runners have commemorated the tragic bombing by participating in the Oklahoma City Memorial Marathon. At the inaugural event, honoring the sixth anniversary of the bombing, Kansas runner Peter Euler won first prize. That first year, nearly 5,000 runners raced around the downtown district after Thomas Hill and Chet Collier successfully convinced the city and memorial foundation to allow it. Now, the marathon draws more than 24,000 runners around the world each year to trek from the Oklahoma City National Memorial & Museum up to Lake Hefner and back down through the downtown area to the finish line at Devon Energy Center.